The Smoking Gun, is the true story of a woman and her teenage son charged in what appeared to be a hopeless murder case. At Mr. Spence’s request, Professor Cole wrote a companion manual for use by law professors interested in using Spence’s book in teaching criminal law, criminal procedure, clinical practicum, ethics, evidence or trial advocacy. The companion manual is a chapter-by-chapter synopsis of the book that highlights teachable topics and analyzes some of the skills and techniques described in the book. 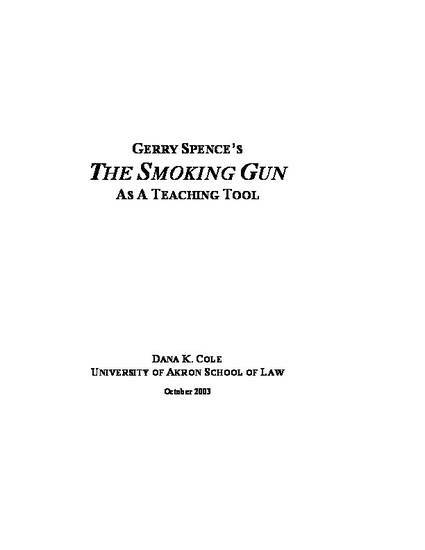 Dana K. Cole, Gerry Spence's The Smoking Gun As A Teaching Tool (2004).